Twitter pal Ashton Kutcher tweeted that wife Demi is reading a book called The Shack, with an eye on buying the film rights for them to do, so naturally we had to check out what this book is about. The premise? Mackenzie Allen Philips’ youngest daughter, Missy, has been abducted during a family vacation and evidence that she may have been brutally murdered is found in an abandoned shack deep in the Oregon wilderness. Four years later in the midst of his Great Sadness, Mack receives a suspicious note, apparently from God, inviting him back to that shack for a weekend. Against his better judgment he arrives at the shack on a wintry afternoon and walks back into his darkest nightmare. What he finds there will change Mack’s world forever. 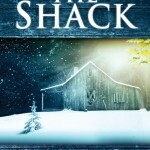 Admittedly, The Shack has the literary value of John Grisham or Stephen King when it comes to plot, but the value of Pastor Rick Warren and the wisdom of Napoleon Hill when it comes to ideas about hope, faith, purpose and religion, an unsual combination for commercial fiction, which may be why it is not published by one of the big companies but specialty house Windblown Media. Every few years, an unexpected bestseller comes out of nowhere, without the backing and hype of Madison Avenue and the buzz machine. The Shack seems to be just one of these gems.